The Nike Hyperdunk, the shoes Kobe's wearing now, it's a basketball shoes engineered with the best players in the world in mind. Nike Flyfit technology provides maximum support with least amount of materials, while tensile fibers provide support while minimizing weight. A full-length Phylon™ midsole with Zoom Air™ unit in heel combined with Lunar Foam in forefoot cushions against court shock. Solid rubber outsole with herringbone traction pattern for ultimate performance. This shoes only weighs 12.9 oz. this is probably the lightest basketball shoes I've ever seen and tried on , the design is not that special, looks like a plain basketball shoes to me and its Hi-cut design is too high for me, it makes me hard to move. 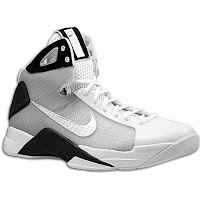 When it comes to Performance I prefer Nike air zoom Kobe III Shoes even if it weighs a little bit more than the Hyperdunk Shoes with 16.4 oz. 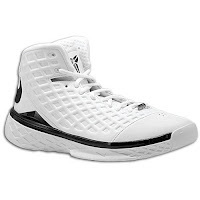 which is considerably a light weight shoes too, it has a wide outsole which is perfect and because of this its stability is incredible its design fits your foot tightly to prevent injuries plus its Hi-cut design is much lower than the Hyperdunk Shoes so it makes you move and turn comfortably. Plus I like the design of this shoes better than the Hyperdunk, the problem is Nike Zoom Kobe III shoes has a higher price than Hyperdunk.